A couple are getting ready for a dinner party when an unexpected discovery involving the numbers 6-6-6 causes a drastic change in plans. A cleverly written and cheeky piece which entertains the possibility that the devil could just be an average man, coexisting incognito among us. Two people in a thirty-eight year old marriage candidly share with the audience how each coped with the devastating news that one of them has cancer. Incredibly moving and heartwarming, I thought this style of storytelling was highly effective and packed an emotional punch. A regular train ride becomes a little bit more interesting when a Russian man talks about his very unorthodox profession with an English backpacking couple. This piece had an intriguing premise with great potential but unfortunately the narrative was a little too open-ended for my liking and left me a bit confused. Geeta is an “urbanized woman of Indian descent” who because of this dual identity finds herself caught between two cultural worlds. A thought-provoking and engaging one woman monologue about being faced with a cultural identity crisis and the internal struggle that comes along with it. A young composer has written the perfect violin concerto and in his quest to get the world’s greatest violinist to play it, he meets the girl of his dreams and as the narrative unfolds, a love triangle forms. The story is told through narration and well-timed hilarious commentary and is a superbly crafted piece. When a game of “Guess Who?” between two sisters starts to become a little too personal, their relationship unravels and we see just how far one of them will go to win. The entire narrative is structured as an escalating conversation between the two siblings which I thought was very well scripted with great comedic value. Everything is going wrong in Sarah’s life but her new upbeat Wellingtonian flatmate tries to convince her that she is not alone and that it is not all bad. An amusing slice-of-life-esque comedy about looking at the bright side of a mid-life crisis. A darker version of your typical “boy meets girl” scenario involving an unsuspecting yet clearly ominous suitcase. This anti-rom com is a brilliantly written work and the perfect representation of a short and sweet play, in my opinion. What if you had a personal narrator who faithfully followed and described your every move in life as well as your surroundings? This witty and entertaining piece explores the idea that everyone has a plot that must be narrated. Two headstrong and opinionated judges meet on a blind date and inevitably aren’t able to resist bringing their work practices to the dining table. An energetic and humorous work performed enthusiastically by the cast. Overall, a nice varied selection of plays and an outstanding effort all round; some works certainly could have given the Week 1 group a run for their money! The results of the votes are already in – congrats to the teams behind The Antichrist Cometh and The Third Person for making it to the Gala Final! 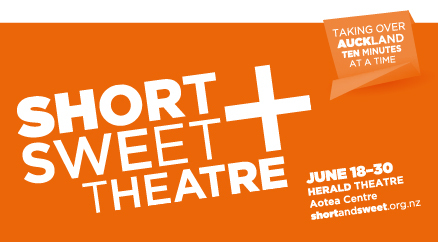 Short+Sweet Theatre will be at the Herald Theatre until June 30th. Click here for tickets. For the full festival programme, click here.